We rent games and activities with the WOW factor and inflatables to handle large attendance events so call, click or come by today! Be sure to watch our awesome interactive game videos below. Interactive games like obstacle courses are the best money spent at parties and events because they will move lots of people and it's fun to race other people. Interactive games like Bungee runs are another fun activity for kids and adults and is a very popular game. 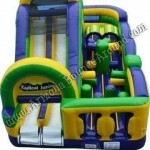 Giant Twister, Zorb Balls we rent then too and lots of other activities for events that will have the guests going crazy. Arizona Bounce Around is a full service party and event rental company serving all of Arizona and Southern California with games and activities for all types of parties and events.